It is relatively complex to specify the lifetime of a fluorescent lamp, because it depends on several variables and can be defined in different ways. Contrary to other light sources they do not always reach an abrupt failure point, but gradually lose their initial performance as they age. Often the light output may decrease so much that the tube is considered useless and must be replaced even though it is still producing some light. The useful lifetime of linear fluorescent lamps can vary from 6,000 hours to 60,000 hours depending on its construction, the operating conditions and type of control circuit. There are two key mechanisms which determine the life of a fluorescent tube. The first is a question of mortality and relates simply to exhaustion of the electrodes at the tube ends. When this point is reached the lamp will fail to start. Lamps do not all reach this point at the same time - minute variations in manufacture lead to some achieving a longer or shorter life than others. The useful lifetime is expressed in terms of a mortality curve, which illustrates the percent surviving lamps as a function of burning hours. 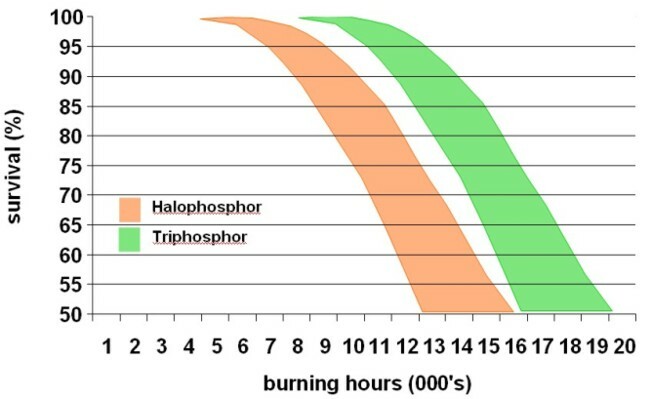 This is illustrated for Halophosphate and Triphosphor T8 in the diagram below. The rated lifetime is usually given as when 50% of the tubes can be expected to have failed. The second measure of lamp life is that of lumen depreciation. This is quite rapid for the older halophosphate coatings, whereas modern Triphosphor materials achieve an admirable lumen maintenance. End of life is generally specified when the luminous flux has dropped below 70% of the original value.